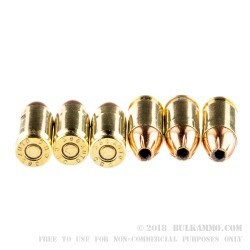 A quality .380 Auto ammo is hard to find nowadays given the picky guns that are being made to shoot them. You kind of just never know what you’re going to get with a new factory compact 380Auto and a round you've never shot in it before. Luckily, MagTech is in a certain sweet spot that gives it a bit more reliability in a bit wider range of guns. 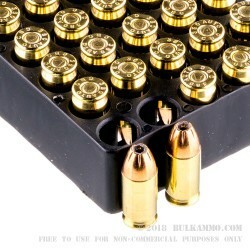 This ammo is pretty good for use across the board for the newer harder to function .380 compacts. 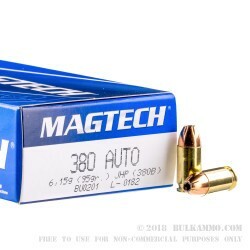 The .380Auto from MagTech is neither super hot, nor basic. It can get 950 feet per second muzzle velocity and 190 ft. lbs. of energy. 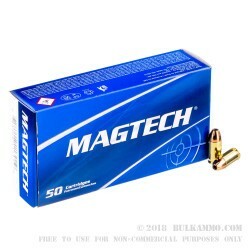 For a round that feeds well, and functions in most newer guns that’s a good set of ballistics, especially considering that Magtech has a very good reputation for self defense rounds over the years for the most part. Brass case, boxer primer; and a well-engineered projectile that feeds well. All this adds up to an easily reloadable cartridge that works in a lot of firearms and still delivers the kind of performance that most premium rounds are getting. The price point is significantly cheaper than most of the premium producer’s personal defense rounds as well.